Pretty much everyone has a food blog these days and so it's only fitting that The Simpsons are catching the food blogging fever in this Sunday's episode (November 13, 8pm, FOX). 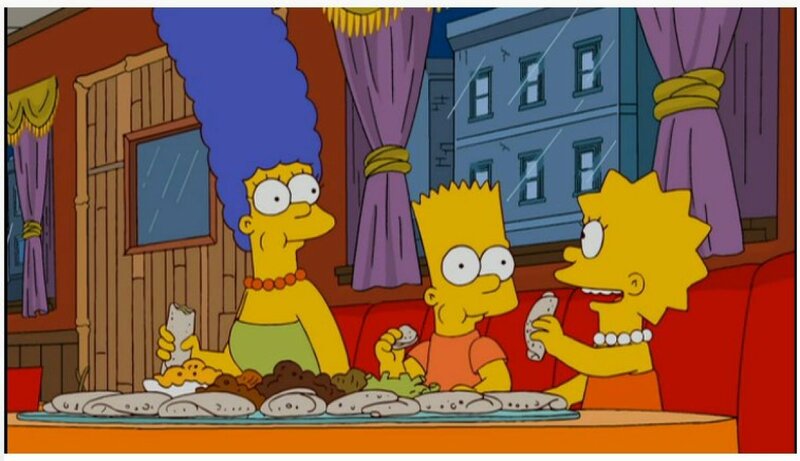 After discovering an Ethiopian restaurant, Marge, Bart and Lisa start their own food blog "The Three Mouthketeers." The trio eventually scores an exclusive reservation at Springfield's premiere modern restaurant. Before the reservation, Marge has an unsettling dream with Anthony Bourdain, Gordon Ramsay and Mario Batali (all voiced by the food personalities themselves) that makes Marge feel bad about not inviting Homer. Ramsay, of course, has an expletive-filled rant. Grub Street has the incredible food-themed rap from the episode and LA Weekly reveals that Homer will have an anti-foodie rant. Robert Sietsema of the Village Voice is less enthused, arguing that this episode signals that the "endtimes for Foodism are near."